As we see out the year of 2014, boxing fans will look back and be nothing more than truly excited about the year to come. Whilst there may not have been many real legacy defining super-fights, many new contenders have emerged, ready to pose a threat to those that dominate. Some divisions have opened up and could be conquered by anyone, while others have contenders vying for an imperious champion. At featherweight a true legend in Nonito Donaire was put away by Nicholas Walters. Sergey Kovalev was not able to do the same to Bernard Hopkins, but he showed he is a worthy successor to the oldest champion in boxing history. Wladimir Klitschko demolished one of the most highly rated contenders for his thrown and beckoned in the next group of challengers. And of course, the welterweight division is still largely ruled by Manny Pacquaio and Floyd Mayweather, leaving a lot of space for anyone in and around them to make a name for themselves. Even at flyweight, Roman Gonzalez had a fantastic year, looking unbeatable. However, all this means is boxing fans are eagerly looking around for someone they think can beat him. So for all those wanting to know who can rock the boat next year, who can make some waves, standout from the crowd and maybe even win a world title, here are five fighters to watch in 2015. Thanks to the two knockout artists reigning at the top, the light-heavyweight division is fast becoming the most exciting in boxing. Now storming up the rankings, Beterbiev is looking likely to join Adonis Stevenson and Sergey Kovalev as part of the division’s elite. The Russian fighting out of Montreal, Canada, is being fast-tracked towards a title shot, as shown when he destroyed former world champion Tavoris Cloud, in just two rounds, in what was only his sixth professional fight. Beterbiev’s last fight saw him floored against 15-0 Jeff Page, before unleashing his obvious power in the second round and putting the American away. Along with these impressive wins as a pro, the former world amateur champion has also beaten Kovalev in the unpaid ranks. Beterbiev also competed as a heavyweight as an amateur, showing he is very big at the weight, likely to eventually fight at cruiserweight. 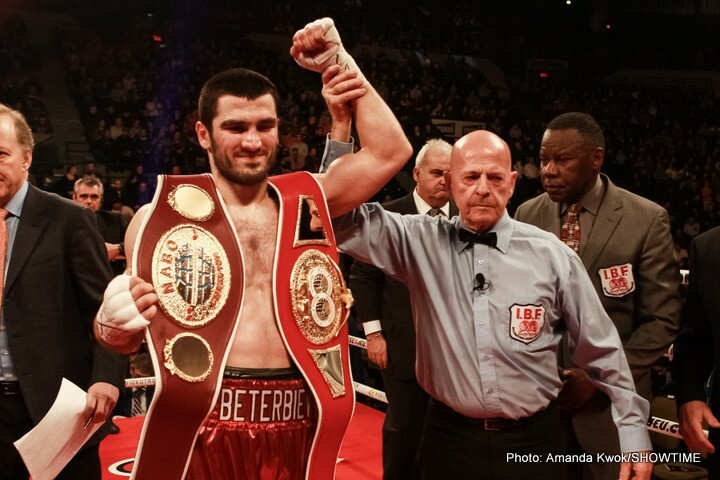 Strong, technical and aggressive, Beterbiev is exactly what one would expect of a quality Eastern European fighter. Aged 30, time is not on his side, but Beterbiev is not looking to take too long in his rise up the division and by the end of 2015, he may just be a world champion. Described by Oscar De La Hoya as “a blue-chip prospect, with everything it takes to be a world champion”, the Mexican-American known as “Pitbull” could make himself a star in 2015. Trained by Freddie Roach, the 22 year old turned professional in 2010 but has had his career stall because of problems with the law – including a stint in jail. However, Gomez’s progress has still been continuous, if not consistent. In July, Gomez put a 10 round beating on former world title challenger Vernon Paris, who at 26 and with a 28-1 record was still very much in his prime. His aggressive style will make him a fan’s favourite, whilst he also has the skill and the desire to create a legacy. The former world amateur silver medallist is coming up at exactly the same time as his former amateur rival Jose Benavidez (whom Gomez beat as an amateur), who is also another top undefeated prospect. Add in Jessie Vargas (another undefeated highly rated Mexican-American) and there are some huge fights that could happen for Gomez in the not so distant future. Considering the king of his division – Danny Garcia – is likely to move to welterweight soon, the light-welterweight division will be wide open and Gomez will be looking to take advantage in 2015. Coming out of the elite school of boxing that is Philadelphia, trained by one of this generation’s most respected boxing voices in Stephen Edwards, Julian Williams is the dark horse of the ultra-stacked light-middleweight division. Known as J-Rock, Williams has also adopted the moniker “Mr Do-It-All”, as he has been brought up to and also shown that he can actually do it all. Now an Al Haymon fighter, Williams was not always seen as a standout prospect, and thus has been matched extremely tough throughout his career. In just his 7th pro fight he fought someone 12-2, whilst in his 14th pro fight he took on the 33-4 former world champion Joachim Alcine, showing he has had it comparatively much harder than others in his division. Nevertheless, Williams has boxed, brawled and shown a variety of styles in between to remain undefeated. In a division where many top names have pulled out of fights against other top contenders, Williams is the man looking to take on all comers. Should the opportunities continue to arise, Williams could be right up the rankings and seen as a real test for the likes of Saul ‘Canelo’ Alvarez by the end of 2015. From Jimmy Wilde to Joe Calzaghe, the tiny nation of Wales has always consistently produced world champions, and Lee Selby is set to be their next one. The featherweight known for making his ring entrance to hard-core hip-hop (Big L’s Lifestyles of the Poor and Dangerous to be specific) is the mandatory contender for the IBF title, after a remarkable run ever since he lost his fifth professional fight. That loss came against the first of six undefeated fighters that Selby has fought in his career thus far. After that scrappy points loss over four rounds, Selby has become hungrier since and looked a class above everyone he has fought, including two spectacular stoppage wins over undefeated fighters Stephen Smith and Joel Brunker, with the latter being his final eliminator for a shot at the IBF title. The only issue for Selby is that the current holder of this title – Russian Evgeny Gradovich – is currently coming off a draw against another top contender, meaning a rematch may be forced, setting back Selby’s title shot. Nicknamed “The Welsh Mayweather” because of his hit-but-don’t-get-hit-back style, Selby states he still has not reached his full potential. The brother of one of Britain’s best amateur boxers, Andrew Selby, Lee certainly has the pedigree of a champion and in 2015 he will be given the opportunity to fulfil it. The 6ft 5in Australian former MMA fighter is one of the most dangerous men in the heavyweight division already, and in 2015 will look to become a legitimate title threat. With a great looking record, some awesome looking knockout wins and a top five world ranking with three of boxing’s four governing bodies, it is a wonder as to why Browne has not already attained a title shot. Many will point to his lack of credible opponents. However, Deontay Wilder’s last win in August 2014 was against Jason Gavern, someone Browne knocked out in 2012 in just his 14th fight. Wilder is now due to fight for the WBC title on January 17th. As well as Gavern, Browne is also currently the only person to have beaten Richard Towers (winning via knockout against an opponent who was 14-0 and an awkward Ingle-gym trained 6ft 8in beast) and Andriy Rudenko (a 24-0 Ukrainian with over 120 amateur fights), showing his competition has been comparatively decent. Last year Browne fought three times and has already said he hopes to do the same in 2015, whilst also stating he is looking to take his average weight down from 19 stone closer to 17 stone. Patient, destructive and with an understanding of how to use his size and weight, Browne is a threat to all in the division. Whilst he definitely looks unpolished, just how far he can go is still up for debate. Under the promotion of Ricky Hatton, Browne has a genuine chance to at least be in line for a title shot come the end of 2015.